Warmer colors are typically the best to go with because they aren’t as plain as white, but still create an atmosphere that’s appealing to homebuyers. Try to find a color that isn’t boring, but still gives people the impression they can change it if they’d like to. That way if they get used to it, they’ll realize they won’t need to cover the cost of repainting it later. Warm neutral colors like beiges, tans, golds, and grays all work well to create an atmosphere that buyers can imagine themselves living in. Avoid white as it comes off as cold and clinical. Look for rooms with walls that appear tired or worn out, then treat those areas first. If there are walls that are damaged or need to be repainted, paint those areas before prioritizing any other. If your rooms are all in similar condition, the best areas to begin repainting include the bathroom and kitchen. A living room can afford to look dated, but bathrooms or kitchens that feel aged are huge turnoffs for homebuyers. Take the time to address the details in a room, such as cabinets or built-in shelving. If you plan on leaving appliances or electronics like entertainment centers with the house, you can paint them as well. If a room feels small, choose a pastel or lighter color. Painting the trim and walls the same color can also give the illusion of a larger room. Alternatively, large rooms can be made to feel smaller by using a darker or warmer color. While color is important, there are many paint types to consider before breaking out the rollers. For example, broad walls should use flat or eggshell sheens to hide any unevenness, especially if you previously had nails installed. Using semi-gloss paints on trim and doors make them easier to remove dust and fingerprints. Choose a mid-tier or high-quality paint instead of opting for the cheap stuff, otherwise you’ll likely need to use multiple coats to get the same effect. Painting a home in time for an open house isn’t easy. 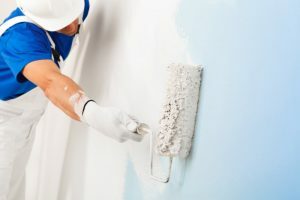 Consider hiring a Plano painting company for additional help today! If you don’t have much of an eye for home design, the Idea Guys at Platinum Painting are the team you need to repaint your interior. Their clients are exclusively homeowners, so if you aren’t sure which paint to choose or color to redesign your home with, they’ll put your worries at ease. To learn more or get a free quote for your home, contact them through their website.